Just yesterday, on August 10th, a jury awarded Dewayne Johnson nearly $300 million dollars in a case that argued he had contracted cancer from using Monsanto’s Roundup. It is an amazing verdict, especially compared to the story of the so-called Radium Girls. 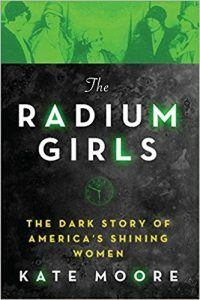 Kate Moore’s The Radium Girls: The Dark Story of America’s Shining Women, chronicles the story of numerous women — and in some cases girls — and their own battle to find justice. These women, in two separate but eerily similar situations in New Jersey and Illinois, were employed to paint the face of dials to be used in military equipment and on watches and clocks. The critical thing about these faces was that the paint glowed, so they could easily be read in the dark. And, to make them glow, the paint contained the radioactive element radium. These women were working primarily in the 1910s and 1920s. Radium had only been discovered in 1898 by the famed Marie and Pierre Curie. Radioactivity itself had only been discovered a few years earlier, in 1896 by Henri Becquerel. So, when the women began working with this element, not much was known. In some parts of the world, particularly Germany it seems, it had been recognized that radioactive substances can cause skin lesions. However, entrepreneurs touted the beneficial effects of radioactive substances, even selling drinks that had radium in it, promising it had health benefits. The Radium Girls describes how the women used their mouths to shape the tip of their brushes to get the finest point to paint the dials. This meant they were ingesting radium. Ultimately, the radium settled into their bones, as it is chemically similar to calcium, and gave many of them cancer. The descriptions of the effects of the radium on their bodies is often gruesome. Suffice it to say, these women suffered considerably as their bodies deteriorated. However, trying to get any kind of recognition that their employment had anything to do with their sicknesses was a herculean task. First, doctors had no idea what was going on to these women as they hadn’t seen these kinds of symptoms before. Radiation poisoning was entirely new to the profession. Second, industrial hygiene law severely limited the liability of the companies. Third, the women were often poor, a situation exacerbated by massive medical bills, and couldn’t afford lawyers. All of these factors came together to make justice elusive for these women. Because of the perseverance and bravery of these women, eventually, the laws changed. Companies became more liable. Protections were put into place. At the time, however, there was nothing to help these women. These women and the effect of radium on their bodies became the best source of the effects of radiation on human health. And, the dangers their deteriorating health warned of impacted the efforts of the scientists in the Manhattan Project. Knowing how these women had suffered, Glenn Seaborg insisted that the health effects of plutonium be studied and that safety guidelines be instituted for workers. One husband remarked “We’ve got humane societies for dogs and cats, but they won’t do anything for human beings.” It is notable how much has changed. The Radium Girls is a stark reminder of how impersonal and profit-driven companies can become if there are no checks on their behavior. How easily human life can be discarded in the name of profits if no one is there to fight for the individual.